The Omaha Storm Chasers have been announced as the recipient of Ballpark Digest‘s “2016 Charity Award” for the organization’s work in the community throughout the 2016 season. The Storm Chasers were also a finalist for the award in 2015. The Storm Chasers organization, through its charitable arm Chasers Charities, set an all-time record in charitable giving in 2016, the fourth consecutive year the club has achieved that feat. In total, the organization donated $768,695 to local charities, an increase of $82,558 compared in 2015. Among the highlights of the organization’s 2016 charitable work included providing a platform for 74 non-profit organizations at Werner Park as the “Community Organization of the Night”. Over $20,000 was raised through the McDonald’s and Huber Chevrolet Hurl the Pearl promotion for the Ronald McDonald House, in addition to over $23,000 donated to local charities, including Let’s Go Miles, Nebraska Organ Recovery and Methodist Hospital Foundation through four Game-Worn Jersey Auctions. In total, the organization also combined for over 420 mascot and player appearances in the Omaha Metro community. The Storm Chasers front office also joined forces to record 932 hours of community service in 2016. A full overview of the Storm Chasers’ 2016 Community Relations efforts can be found online at www.omahastormchasers.com/community. The Storm Chasers return to Werner Park for Opening Night 2017 on Tuesday April 11, 2017. Lexington Legends’ President/CEO Andy Shea planted a kiss on a pig Saturday night. Shea was the winner in the American Diabetes Association “Kiss a Pig” fundraising campaign. He was one of 10 local celebrities in whose names donations could be made. His total of more than $45,000 raised led the way, and as the winner, he kissed the pig – now named “Pig L” in reference to the Legends famous mascot, Big L.
Pig L will be a part of the Shea household, and is expected to occasionally visit Whitaker Bank Ballpark for some Legends’ games next season. Cedar Rapids, IA – This season, three Kernels Take the Lead charities: Transamerica K’s for Kids, Millhiser Smith Home Runs for the Iowa Donor Network, and CarePro Health Services Plating for Plates, helped raise over $36,000. Transamerica K’s for Kids: The Transamerica Foundation donates $25 for each strikeout recorded by a Kernels pitcher, at home and on the road, to Kids First – an organization that provides focused legal services for children. This season, Kernels pitchers recorded 1,231 strikeouts for a total of $30,775 to Kids First. Millhiser Smith Home Runs: Millhiser Smith and West Bend Insurance donate to the Iowa Donor Network for every home run the Kernels hit at Perfect Game Field. This season the Kernels hit 36 home runs as Millhiser Smith and West Bend Insurance donated $2,500 to the Iowa Donor Network. CarePro Health Services Plating for Plates: CarePro Health Services donates one plate of hot, nutritious food, the equivalent of $5, for every run the Kernels score at home and on the road to Horizons Meals on Wheels. 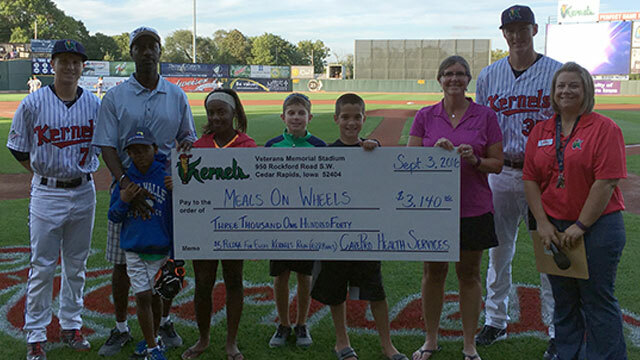 This season, the Kernels scored 669 runs and CarePro Health Services donated $3,345 or 669 plates of food to the Horizons Meals on Wheels program. The Kernels would like to thank the continued support of the Transamerica Foundation, Millhiser Smith, West Bend Insurance and CarePro Health Services for their continued support of these Take the Lead charities. From the Front Office to the dugout “Take the Lead” exemplifies how teamwork and collective efforts support and benefit the Cedar Rapids Corridor. The Kernels are committed to being the community beacon for education, social and recreation programs. The Omaha Storm Chasers set an all-time record in charitable giving for the fourth consecutive year in 2016. In total, the organization donated $768,695 to local charities this year, an increase of $82,558 compared to last year’s top mark. The Storm Chasers organization provided a platform for 74 non-profit organizations at Werner Park as its Community Organization of the Night. The McDonalds and Huber Chevrolet Hurl the Pearl promotion also raised a record number of $20,663 for the Ronald McDonald House. In addition, over $23,000 was donated to local charities including Let’s Go Miles, Nebraska Organ Recovery and Methodist Hospital Foundation through four Game-Worn Jersey Auctions, with players and coaches wearing specialty jerseys. The organization remained visible throughout the Omaha Metro, with mascots and players combining for over 420 appearances in the community. The Storm Chasers front office also combined for 932 hours of community service in 2016. The Omaha Storm Chasers are the Triple-A Affiliate of the Kansas City Royals, and play at Werner Park in Papillion, Sarpy County, Nebraska. For more information please visit omahastormchasers.com and follow us on Twitter @omastormchasers and at facebook.com/omahastormchasers. The Storm Chasers return to Werner Park for Opening Night 2017 on Tuesday, April 11, 2017. 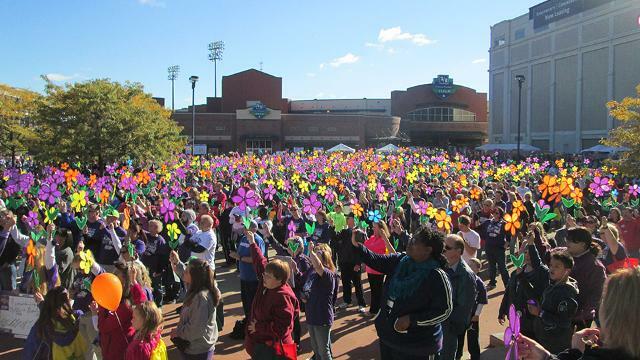 The Alzheimer’s Association invites you to join them at the Dayton Walk to End Alzheimer’s on Saturday, October 8. The Walk will be held at Fifth Third Field – home of the Dayton Dragons. Registration will open at 8:30 a.m., and the Opening Ceremony will begin at 10:00 a.m. The Walk will start following the opening ceremonies. The Alzheimer’s Association Walk to End Alzheimer’s® is the world’s largest Alzheimer’s awareness and fundraising event. Held annually in more than 600 communities nationwide, this inspiring event calls on participants of all ages and abilities to reclaim the future for millions affected by the sixth-leading cause of death. By participating in the Walk, you will help fuel the Alzheimer’s Association’s mission-related initiatives of research, and care and support in the Miami Valley. Alzheimer’s disease is an epidemic, currently affecting more than 200,000 individuals in the state of Ohio. With your help, we can end this devastating disease together. The end of Alzheimer’s starts with you. Will you join us on October 8?